Located in St. Louis City real estate, homes for sale in Benton Park MO are conveniently located minutes from the Arch, The Fox Theater and the new Cardinals baseball stadium. Benton Park Real Estate and Benton Park properties are a perfect addition to the St. Louis Real Estate market. Benton Park real estate is known for the preserved historical features of the area. The Homes for sale in Benton Park MO range in price from approximately $50,000 for gut rehab properties to $350,000. The median home price in 2014 was approximately $165,000. In 1985 Benton Park earned the distinction of being the largest historic district in St. Louis. The average age of the homes in the area is 115 years and many of the homes have preserved their original architecture. Benton Park is also home to well visited Cherokee Antique Row you can find original furniture for your historic home. The Benton Park residents are served by different schools depending on the area, you can contact the recruitment and Counseling Center at 314-633-5200 for all school information in the area. See Great Schools for up to date ranking on every school in the area. If you are looking for a home for sale in Benton Park MO or you would be interested in buying a home in Benton Park, please contact St Louis County real estate expert, Sharon Colona and St. Louis Realty for a professional and simple buying or selling process. Call (636) 397-7653 or email at scolona@stlouisrealty.net. A phenomenal historical rebuild in Soulard**3 bedrooms, 3.5 baths, extra deep 2 car garage (perfect for golfcart parking), & a beautiful stamped concrete patio and walkway***Beautiful gleaming engineered wood floors on the first and second level, historical period correct white millwork, paneled doors, soaring ceilings, insulated windows, too much to list! Inviting living room with gas fireplace, separate dining room, to die for kitchen with Waypoint painted pewter Glazed cabinetry complimented by Super White Granite**upgraded stainless steel appliances, center island, farm sink**Oil Rubbed bronze hardware & fixtures**Private mastersuite with balcony, undescribable full bath (pictures are worth a thousand words) & 2nd ensuite, second floor laundry with storage & folding area***Third level boasts bedroom, full bath, dude space recroom sporting a wet bar and beverage cooler**All this within walking distance to fabulous restaurants, bars, parks and gardens! This is a good as is sounds! Location & luxury come together in this stunning, spacious gut renovated home just steps from Benton Park. You can have it all: 5 bedrooms, 3.5 bath, walkability, spacious yard with deck, and a 3 car garage (yes: three!). Impeccable attention to the finishes & details adorn this home, from the well crafted moldings to the standout light fixtures and more. The decadence begins as you step inside: the living room is practically the size of a basketball court & has a gorgeous fireplace on each end. There are also two master bedrooms (on both the main and 2nd floors); each master bathroom has gorgeous ceramic tile & granite topped double vanities. Plus, the real gourmet kitchen has custom cabinetry and stove hood, a true walk in pantry, beautiful granite counters & stainless appliances. The second floor features a bonus lounge space complete with a wet bar and wine cooler. All the boxes are checked; this is a true 'must-see' for the discerning city dweller. Est. 1907: 3 story all brick manse hosts PRIVATE RESIDENCE on 2nd+3rd floor. With only 3 owners in 112 years, the arts & crafts historic details are finely preserved including warm woodwork, intricate stained glass, wainscoting+beamed ceilings. Main living space showcases formal living rm overlooking Tower Grove Park, reading rm, stately dining rm, updated kitchen w/CENTER ISLAND, Butler x2019;s Pantry, a media room/bedroom+FULL BATH. Find 4 expansive bedrooms, two w/WALK-IN closets. The full bath on this level completely remodeled w/period features. Ground level offers unique opportunity. Originally built as doctor x2019;s office, first floor has 4 large rooms organized around a central rotunda and +HALF BATH. Currently being utilized for the family x2019;s hobbies + entertaining purposes such as game room, dance studio, office + music room. The separate business entrance off S. Grand, offers opportunity for commercial/professional use, conversion to AirBnB, separate apartment, or in-law quarters. It's a walkable life! Beautifully renovated 5 BR/2.5 Bath Tower Grove East mansion on DOUBLE LOT. 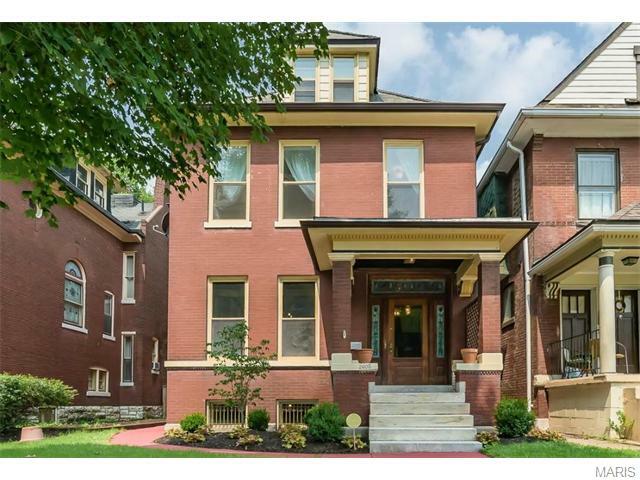 2 Blocks walk to Tower Grove Park and 2 blocks to South Grand shopping/dining give this address a walk-ability score of 81. xD; xA; xD; xA;Ground floor exudes Victorian charm and workmanship. Entry Foyer is spacious and welcoming, and living room/dining room area can be opened up or separated with original pocket doors. Each room has a fireplace. The kitchen is galley style with a mix of original tin ceiling panels and modern stainless-steel appliances and updates. The breakfast room features beautiful mosaic tiles, 3 sides of windows and Southern exposure. xD; xA; xD; xA;2 stairways (one illuminated with original stained glass) lead to the second floor, with 4 ample bedrooms and a bathroom. Two bedrooms have balcony access. xD; xA; xD; xA;The master suite is loft style on the third floor. There is a laundry room at the top of the stairs. xD; xA; xD; xA;Dry/clean basement. NEW SLATE ROOF! High efficiency HVAC system. 2 car garage. You will be blown away with the character and impressed with the sheer size of the space. 1700 sq feet per floor offers the space of two houses. Very unique set up. The home sits as a single family and a two family. The owner enjoys the second floor, first set of pics, and uses the first floor as a AIRBNB. It was a way for her to share her love for the home and neighborhood. Located across the street from Tower Grove Park and a few blocks from South Grand has provided years of enjoyment. Seller averages $120/night when offered on Airbnb. It would make a perfect inlaw or nanny situation. Long term rental is a possibility too. The home has been maintained to keep as much history as possible. You'll fall in love with the woodwork, light fixtures, 4 gas fireplaces and the dining room on the first floor is a personal favorite! Even the backdrop of the church in the back is amazing to have as your view. The basement offers one huge room for endless possibilities and bonus garage parking. Historic Victorian-era charm meets city luxury at this stunning Benton Park home offering 3,700 sf of living space plus a studio suite perfect for AirBnB. Gleaming hardwood floors greet you & natural light fills the house. The main level is an entertainer x2019;s dream: 2 living rooms, formal & casual dining, plus a chef x2019;s kitchen complete w/ premium appliances- gas range w/ hood, granite counters, tons of cabinets, 2 sinks & breakfast bar. Just off the kitchen, a wet bar & sitting room lead to the fenced back yard w/ oversized 3-car garage. Upstairs, the luxurious master suite offers a spa-like bathroom plus bonus TV room/den. 2 additional bedrooms w/ Jack-and-Jill bath & a separate laundry complete the upper level. The downstairs studio suite offers huge cash flow opportunity via short or long-term rental, or the convenience of work-from-home. Don't miss area hot spots like Blues City Deli, Sidney Street Cafe and more, plus convenient access to I-44 & I-55 all steps from Benton Park. AMAZINGLY Done HISTORIC CLASSIC, Enjoy City Living at its best in a sought after neighborhood. Stroll a few blocks and enjoy family time at Tower Grove Park or Botanical Gardens! South Grand is full of many dining choices, Sekisui, MoKabe, Sashas, ETC. Get the charm & ambiance of a Historic home with the modern desires, UPDATES & comfort of a new home. Beautiful covered front porch and rear decks perfect for morning coffee! Kitchen has 42 cabinets, Granite, Stainless steel appliances. 1st floor bath is PERFECT for guest. Newer Roof, Hardwood Floors, NEW Windows, NEW Plumbing NEW Zoned Heating & Cooling, NEW Electrical. Ceiling Fans & Recess lighting. 2 Story Decks perfect for backyard entertainment! 2 Garage perfect during winter for parking. Close to Downtown Business District. FHA READY!! Start your new chapter in a family neighborhood a few steps from the Tower Grove Park. Welcome to Benton Park Neighborhood. This beautiful three bedroom, 3.5 bath home features incredible updates throughout including a dream kitchen with a huge white granite center island with a prep sink & a pot filler by the stove. There is a first floor half bath & full baths adjoining each bedroom on the 2nd & 3rd floors, an incredible master suite with a fireplace & a luxurious bath. The other bedroom on the 2nd floor has it's own deck overlooking the yard and the park. Head to the third floor which could serve as a fantastic family room. The laundry is in the third floor bath. Venture out to the rooftop deck to enjoy quiet sunsets, peaceful nights, or maybe even fireworks! The rooftop deck looks over Fremont Park which sits behind the house & makes for a lovely view along with the picturesque rooftops. Fremont Park is home to a playground, softball field, and future dog park. This house is located just a short walk from Benton Park & many wonderful restaurants. Pestalozzi Point Townhomes: This townhome is ready to finish to your specifications & dreams if you hurry. Construction is continuing. The possibilities & features of this townhome are endless. Tax abated for 5 years FOR UNDER $200/year! 2 secured, covered parking w/electric gate & fenced entry. Above this covered parking is a very privatized & oversized deck. Main level floor plan is open & airy with custom windows. The 2nd floor is the masters' floor w/master bedroom, luxury master bath, laundry, secondary bedroom or use as a study or office. From the staircase, it is a short walk to the huge rear deck, perfect for entertaining and that morning coffee. 3rd floor houses another bedroom suite and front partially covered deck/patio facing east. The basement is ready to easily finish w/full bath rough in. Come see the quality of construction before you buy & customize to your exact needs & wants. Display available to be shown at 2909 Indiana mls 18064635. Originally a boarding house for weary travelers,this circa 1900 building has been transformed into a palace sized single family home right across from infamous TowerGrovePark.The Night Watch doors with stained glass just beg to be opened.Imagine entertaining in the parlor with the mahogany fireplace surrounded by exposed brick.This flows into the stunning living room & dining room.The custom eat in kitchen features Soft Close Shaker style cabinetry,White Zen quartz counters, Dark Walnut butcherblock island&open shelving,SS appliances,tile backsplash,pantry + butler pantry/mudroom,& inlay hardwood floors.The first floor is completed with a bedroom/flex room and full bath.Up the stairs leads to two bedrooms,a dressing area/office with a balcony,2nd floor laundry,& Master Suite with 3 closets w coffee bar,2 vessel vanities,marble tiled rainfall shower,& clawfoot tub!Outdoor living space includes a canopy,patio area,& 2 CAR GARAGE.WO BSMT,NEWER ZONED H&C,ELECTRIC,PLUMBING. WELCOME HOME! This charming brick historic home has been rehabbed from the inside out, with absolutely nothing left to do but to enjoy! Once a 2 family home, converted to a MASSIVE single family home, there is so much space to entertain. Beautifully refinished hardwood floors welcome you into the light filled living room which gives you sightlines all the way to the back of the house. If you like entertaining this house is for YOU! The kitchen has custom cabinetry, granite countertops, stainless appliances, HUGE island and built in beverage fridge! Main floor laundry. Upstairs you will find 2 large guest bedrooms, beautifully done full bathroom, open area surrounded by exposed brick perfect for a little office and of course, your breathtaking master suite oasis! SO MUCH SPACE, wall to wall closets and master bathroom with double vanity sinks, custom shower and freestanding soaking tub. Upgrades all throughout this home! Outback: Large private deck, fenced yard and 2 car garage. OPEN SUN APRIL 7th 1-3pm Beautiful town home on highly sought after McNair Avenue in the heart of Benton Park. 3 Bedrooms, 2 1/2 baths... perfectly appointed. Walkable to best restaurants in St. Louis including Sydney Street, Fraizers and Peacemaker. Living and dining room combination with exposed brick and tri-colored Brazilian Cherry floors will wow you at the front door! This space is great for entertaining. The upscale kitchen has granite counters, stainless steel appliances and walks out to a private wooden deck... perfect for grilling. The second floor offers two large bedrooms, one with a balcony. With exposed brick and over 11' ceiling in each bedroom, one can be used as a family room or study. A full bath and washer/dryer round out the second floor. The third floor hosts the master bedroom with en suite bath. The deck off of the kitchen leads to a private courtyard with plenty of green space for gardening. The TWO CAR GARAGE opens to the courtyard for easy access to the house. This beautiful and spacious 3,300 square foot row house is just blocks from Benton Park and Cherokee Street! The 3-story home was fully renovated 10 years ago and has been recently freshened up for you to move in today! Each of the 3 bedrooms has a full bathroom attached for privacy as well as a main floor bathroom off of the living room. The second floor has two bedrooms and laundry room complete with hookups. The third floor with a large walk-in closet could function as a large master bedroom or as a large game room/theatre. xD; xA; xD; xA;Priced under $100/sf this house is a bargain for the size. Est. 1894. A remarkable piece of history. Mixed used red brick lovely has potential for commercial space on the main level and so much wonderful living space on the second and third floors. Original restored hardwood floors throughout main 1st floor. As much as original woodwork was maintained during renovation including functional pocket doors. The current owners have absolutely LOVED on this house during their ownership. New roof (2018) sweet rooftop deck removed and replaced (2017) 2 car garage with opener completely tuckpointed inside and out and new roof (2017) New iron fence installed (2015) Both bathrooms updated (2016). Walk to all the best that Cherokee has to offer...coffee in the morning right across the street at the Mud House, lunch at Byrd and Barrel, minutes from all the best of Benton Park and Soulard. Beautiful historic home located in the heart of Benton Park. Complete renovation in 2008. Large rooms and high ceilings throughout. Fireplaces on 1st and 2nd floors. Spacious kitchen includes beautiful maple cabinets, granite counters, stainless appliances, and center island. 2nd floor boasts bright sitting room with balcony, laundry room and master bedroom suite. Master bathroom features double sinks, oversized shower and separate tub. 3rd floor has a family room, full bath with double sinks plus 2 more additional bedrooms. Finished basement includes wet bar and full bath - perfect for entertaining! Level fenced yard and parking pad. This is a LOT of house!!! Don't miss this REMARKABLE 4 bedroom 2 1/2 bath house sitting on a huge lot! This home boasts over 3,200 sq ft (not including the basement) giving you plenty of room to spread out and enjoy. Full brick, low maintenance and chock full of little (and big) luxuries. Imagine coming home, stepping on those gorgeous hardwood floors and relaxing by one of your 2 fireplaces, or cooking in your spectacular kitchen with glass front cabinets, pantry and a balcony perfect for morning coffee. Do you like to entertain? Just take a look at these room sizes! Main floor powder room, exposed brick and formal dining room round out the first floor. The upper level has 4 good sized bedrooms, a master ensuite with walk-in closet, full luxury bath with separate tub & shower. AND GET THIS - IT HAS A 2ND FLOOR LAUNDRY! talk about location minutes from shopping, great restaurants, hospitals, schools and so convenient to downtown. Remote control gated parking and metal fencing gives you plenty of privacy. Now ready viewing these amazing 3 story town homes boasting over 2700 sqft of living space. As you walk inside you will notice the attention to detail that was done when redesigning these homes. Walk inside and you cannot help but love this open concept and bright design. Updates include the following:New Windows Throughout,All New Framing & Insulation,New Wide Plank Hardwood,New Luxury Tile In Baths,New Plumbing and Upgraded Fixtures,New Electric Wiring Throughout, New HVAC systems,Upgraded Plush Carpeted Bedrooms,Newly installed Doors and Hardware, Luxury White/Cream Cabinetry In Kitchen,Custom Paint Throughout,Ample Recessed Lighting,12 foot Ceilings on Main 2 levels Exposed Brick,Upgraded Solid Surface tops in Kitchen and Baths ,Newly Installed Stainless Appliances,Gas line and Water Line, 3rd Floor Features Private Entrance Apt/Guest Suite,Private Bedroom ,Upgraded Kitchen and Newly Installed stainless Appliances. Thats not all contact us today for your private tour! Great Brick and Stone 2.5 Story home, in sought after Benton Park 2600+ Square foot, 2+ Bedrooms and 2 full baths! Even a 2 car garage. Interior freshly painted, newer 90+ furnace. Brand new central air just installed, Hard wood flooring is in great shape and has been newly refinished up the steps & thru out the 2nd floor. Newly installed Kitchen w/ Beautiful Black Quartz Counters, New 48 Cabinets and Corner Center Island style breakfast bar. Built in Traditional pantry with tall cubby storage at top. Separate dining room has new light fixture fresh paint and is perfect for family meals or entertaining, with a handy coat closet or make into 2nd pantry. 10' Ceilings thru out the home give the spacious feel you will love. Living room has ornate wood mantle/non functioning fireplace 1 of 3 in the home, new lighting and plenty of room for any size furniture. New 200 amp service electrical panel and, all appliances stay even washer and dryer. 3rd Floor for you to finish and enjoy.